Stonybrook is set on 160 common acres of protected farmland with classic Vermont scenery with rail fences, hay fields and spectacular panoramic mountain views. Stonybrook complex has many wonderful features to offer including six tennis courts, two outdoor heated pools, 14Km of Cross Country Trails, 3 hole golf practice area, exercise room, hot tub and sauna, game room and the Recreation bike path is on premises with groomed cross country ski trails that stretch over 160 wooded acres. There are six ponds with frogs to catch, complimentary Internet and wood is provided for the fireplace. Just minutes from the Stowe Country Club, Stowe Mountain Resort, Trapp family lodge and the village. Notchbrook Townhouses have one-two bedrooms with four levels of living space. 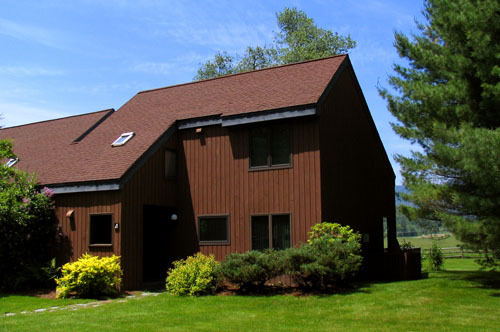 Beautiful features include: Mountain views, wood burning fireplace and each bedroom with a private bathroom. Outdoor heated pool that is opened year round, men and woman’s saunas, tennis court, basketball hoop, hiking trails and children's play area with playhouse and swings. Laundry facilities on site not in all individual units, some units have private facilities in the unit. Enjoy the proximity to the slopes of this well-equipped condo. A gas BBQ grill is provided for guests to enjoy located by the pool building.